Lotteria, one of the most unusual fastfood chains in Japan, has rolled out burger towers in the past (more here and here). And now, those burgers are being memorialized in actual sized burger-shaped USB memory sticks. According to Weekly ASCII, these burger USB sticks mark the seventh anniversary of Lotteria's line of "zeppin" (superior) line of burgers. 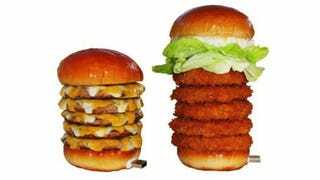 There is a five-patty zeppin cheese burger USB memory, and a five-patty shrimp tree burger, measuring 18.5 centimeters high. Both sport 4GBs of memory and are not food you can actually eat. These are one-of-a-kind items that Lotteria is giving away via Twitter to two lucky individuals. I realize this is a stunt, like this KFC promotion, but I also kind of wish Lotteria would sell these.